He was the only person I ever knew, anywhere, who was never afraid. Shari and Pete in Australia enjoying a thrilling moment together. 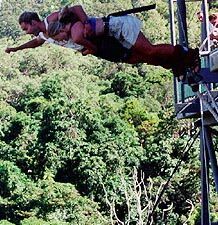 Not seen in picture is Ellen, who is overboard to port, holding on for dear life. 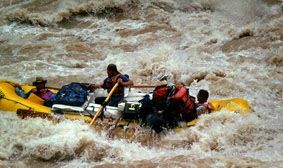 She was pulled aboard just before the next set of rapids and claims to have truly enjoyed the beauty and grandeur of the white waters of the Colorado River. Hidden behind high bluffs in Half Moon Bay, Mavericks can't be seen from the highway unless you know where to look. 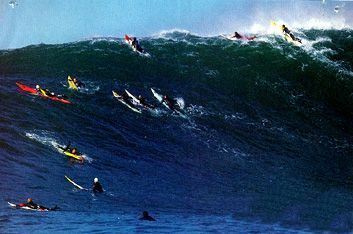 It was first noticed in 1962 by a surfer from San Francisco named Alex Matienzo. He named the spot after his German shepherd, Maverick, who had followed him into the waves. Mavericks to Madness, an annual event organized by Pete and Shari, is a one of a kind workout. 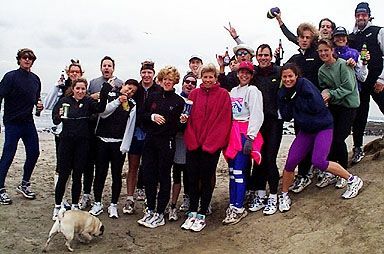 The 7 mile run course winds along the Half Moon Bay coast and includes stops at numerous bars and saloons along the way. This is no way to train, but it sure is fun and great for morale.